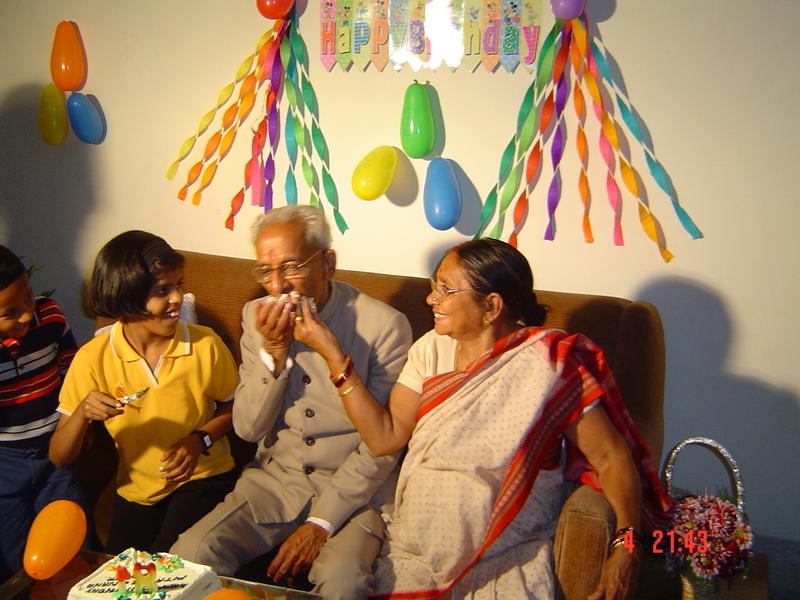 It all started with the idea of doing “something” to mark the day Pitaji would turn 80. That day was 4th February, 2005. There had to be something special, but I could not get around to deciding what. A gift like a shawl or clothes sounded too mundane, a family get-together perhaps better and a dinner with close friends and relatives even more so. But I could not make up my mind till a new idea surfaced. Why not a public felicitation ceremony in Jamshedpur (where Pitaji has lived for the past fifty years) with the participation of his colleagues, relatives, students and other well-wishers! As I mulled over this, it occurred to me that we could even get people who have known Pitaji to write their personal memoirs and publish these in a book form which we could release in the ceremony. The idea was potent, but there were challenges in its execution. Someone had to request people to write. Someone had to edit the stuff. Someone had to get it published. Plus the matter of organizing the ceremony itself. My siblings and I are scattered across the country and none of us had the wherewithal to execute this rather ambitious task. We do have a sister in Jamshedpur but she had her hands full with her job and running her household. I called her up and sounded her off. She was enthusiastic, as usual, and came up with a brilliant suggestion. Maybe we could request Prof Bhaskar Rao, an ex student of Pitaji, an eminent literary figure, settled in Jamshedpur to help us with this project. I had met Prof Bhaskar Rao (who I now address as Bhaskar Bhai sahab) decades ago and I had no contact with him thereafter. I got his phone number and called him. Initial pleasantries having been dispensed with, I came to the point. “Bhaskar Bhai sahib, I need this favour from you.” I explained to him the project and sought his help. He sounded a bit flummoxed initially but he recovered quickly and asked me to write out my thoughts in a letter and send to him. A brief as it were! In the follow-up call a few days later, he readily agreed to handle this rather taxing assignment of editing the book and from then on we kept in touch on the phone discussing various points regarding the book. I had this woolly-headed notion about this book being a surprise for Pitaji. I did not want to tell him about the book. “It is very unfair to keep someone whose commemorative book we will be publishing to keep totally out of this”, Bhaskar bhai‘s baritone over the phone. “No. we can’t”, Bhaskar Bhai said, and to add a touch of finality, he added, “I have spoken with some others and they too want Pitaji to know what is afoot.” The others include heavyweights like Narendra Kohli ji based in Delhi, that eminent award-winning novelist, also and ex student of Pitaji. That kind of sealed this but I persisted. “Bhaskar bhai sahab”, I said, “Maybe we could tell Pitaji about the book, that we are indeed publishing something, but he need not know the details”. This he agreed upon, thankfully. I called my sister and went through with her the list of all those who have known Pitaji and could potentially write on him as well. Each name triggering off memories from the childhood days. “What about so-and-so chacha?”, She would ask. We called all peers of Pitaji, chacha. “He will be a great choice.” I am enthusiastic. And then a moment of doubt for me. “I hope he is still alive.” My voice falters a bit. I have been away from Jamshedpur far too long. “Of course he is. I saw in the marketplace just a couple of months ago. He was carrying, what must be, some ten kilos of sabzi in the jholas he had. We laughed and added him into our growing list. And there were those compromises. “Why leave out this chahcha when we are asking the others.”, she would say. “But value is he going to add?” I always thought this gentleman to be a pompous guy, given to showing off his rather sparse knowledge. “Never mind the value-add, he will not like it that we asked others and not him.” My sisiter was right, he did have a nuisance value. And thus our list built up over successive phone calls. “I want the phone numbers of these people.” I did not have any! Then starts my marathon with the phone. I would reach home after office each evening and make calls. Some are available, some are travelling, while some have had their numbers changed. If I get them on them line, my script remains the same. “Chacha, mein Bangalore sey Santosh bol raha hoon.” (“Chacha, this is Santosh speaking from Bangalore.”). Chacha. Or Chachi, Didi, Bhaiya etc. “Santosh, kaun?” the voice would rarely have any hint of recognition. Nearly always surprise, indifference or sheer boredom. “Santosh, Santosh! Santooooosh?” very few would recognize me at the first instance. Could hear their memory cells crawling through their lanes as I waited impatiently at my end. “Santosh. Arey, Santoooosh!” the penny seemed to be dropping. “Wohi Santosh! Prof Ojha ji ka beta. Jo engineering kar raha tha, wohi naa?” They take me back some 25 years ago. And I would tell them my entire story. School, engineering and beyond. After all these preliminaries are exchanged, we will get to business. And I will quickly explain to them my project. And that since they know Pitaji so well, they must write an article for this book. All would readily say yes. But after another long-winded chat. I shall spare you the details. Over a period of a few weeks I managed to get in touch with some 70-80 persons nearly all of whom committed to write “something”. 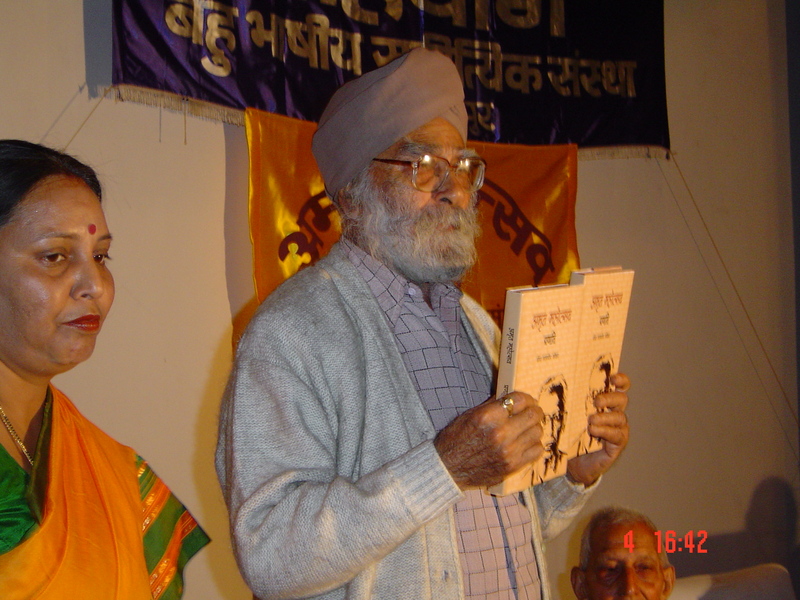 Getting people to write was one thing, we also wanted to have a public ceremony where Pitaji would be facilitated and the commemorative volume released. And who would organize the function? Help soon came in the form of a cultural organization called “Sahyog” led by the dynamic Mrs Juhi Samarpita who took on this responsibility. An auditorium was booked, refreshments ordered and invitation cards printed and sent across to the invitees. Bhaskar Bhai and some other students formed a small committee to decide the course of events for the afternoon. The first decision made was while many would want to speak in this occasion, the number of speakers would be kept limited. There would one representative from each of the publics: colleagues, students, relatives and Jamshedpur Bhojpuri Sahitya Parishad. And Pitaji, of course. As it transpired later, there were a few more speakers added, more about that later. 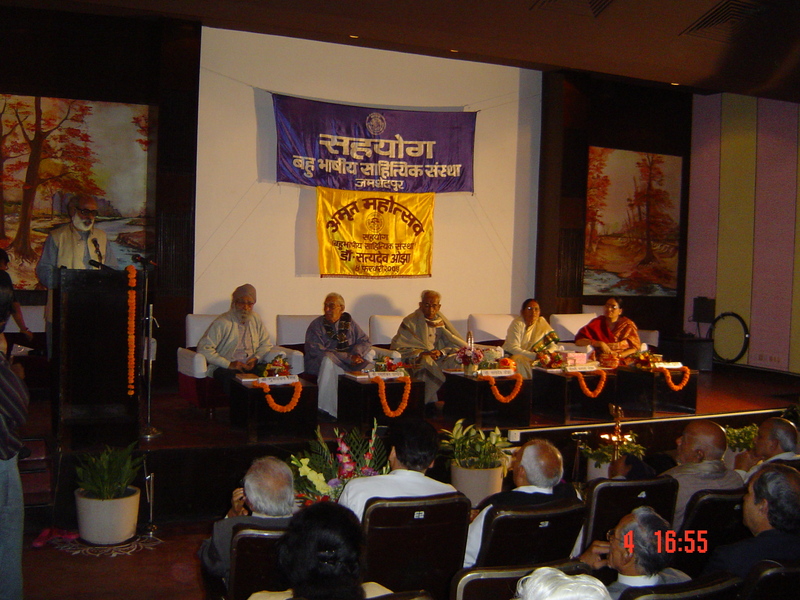 The program also had its own name, “Amrit Mahotsav”. 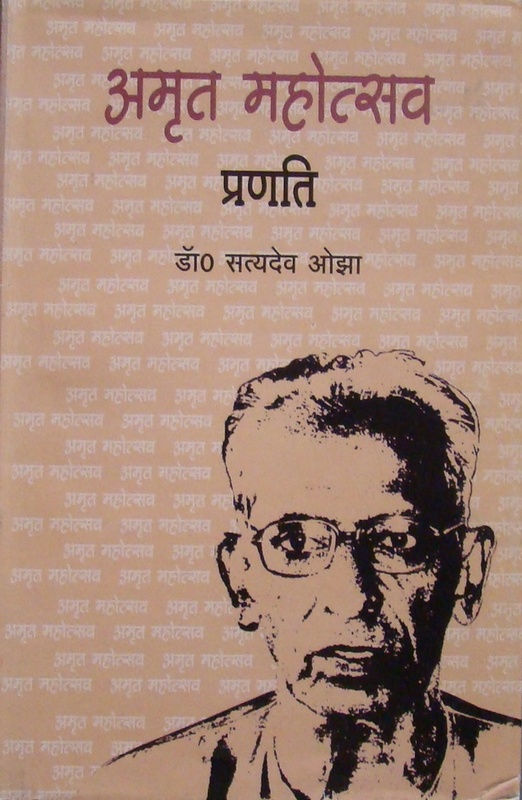 And yes, the book-in-making was titled “Pranati”. 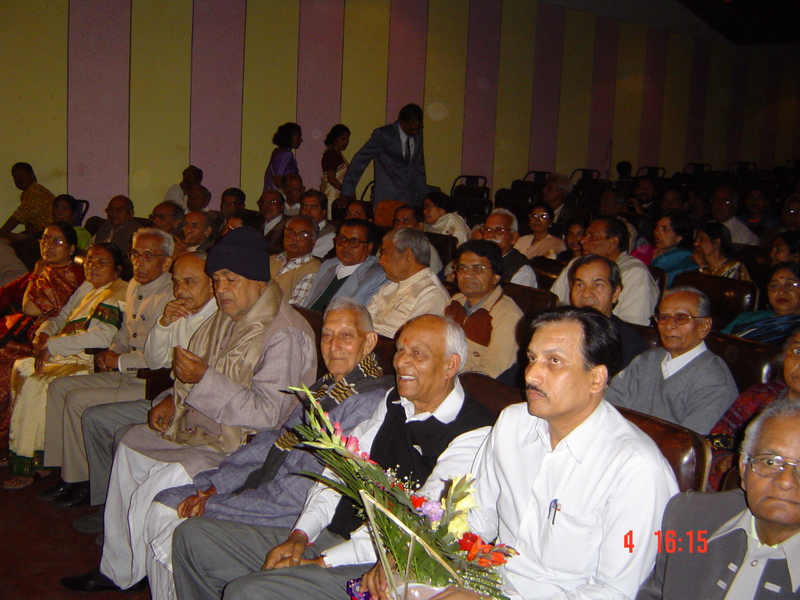 As it turned out eventually on the 4th of February, 2005, the day Pitaji turned 80 and the day of the function, the program stretched into a three hour affair. The organizers had conceived “Amrit Mahotsav” as a three-part program. The first part started with the recital of Sanskrit shlokas followed by the welcome address by the chairperson of the organizing committee. Then came the book release. The host of dignitaries on stage unwrapping fresh copies of the book placed on the dias in front of them. On-stage felicitation followed with many going on stage with flowers, shawls, etc. On behalf of the ex-students of Pitaji one of them (who happens to be the compere, Prof Bhaskar Rao’s, wife sang the “Guru Vandana”, a large, laminated copy of which she presented to my father along with a gift. The gift being a silver replica of Krishna charioting Arjuna in the Mahabharat. Wonderful idea that, the gift from students to a teacher! A senior Professor, who considers herself as Pitaji’s shishyaa though she was never taught by him sang something which she specially write for the occassion. The second part comprised of selected speakers. One selected each from Pitaji’s colleagues/ peers, students, the local Bhojpuri Parishad and one relative. The colleague representative was non other than the venerable Prof. Major C B Sinha, who besides being the head of the Hindi department (effectively Pitaji’s immediate boss) was also a part-time official of the NCC, holding the rank of “Major”. A stern disciplinarian, a fabulous organizer and a gold-hearted person. And when he spoke, his regards for Pitaji poured forth. In his eloquent choice of words, Sinha chacha (as I have always called him) spoke about his long relationship with Pitaji and the high regards he held him in. There is one reference which I will never forget. Sinha chacha, while mentioning the rigours Pitaji had to go through in raising his children, quoted something which Pitaji had told him decades ago: “One generation has to negate itself to firmly establish the next one on the path to success.” That is exactly what Pitaji did for all the years of his life. I have written about it elsewhere on this blog; Pitaji sacrificed his love of reading and writing so that he could be with his children through their formative years. Pitaji’s student, the respected writer Prof Bachchan Pathak Salil, who himself is not much younger than Pitaji, spoke in his unique witty way about their association. He, in the tradional Vedic style, introduced himself at the outset to the audience as so-and-so, son of so-and-so, resident of such-and –such and a student of the so-and-so! 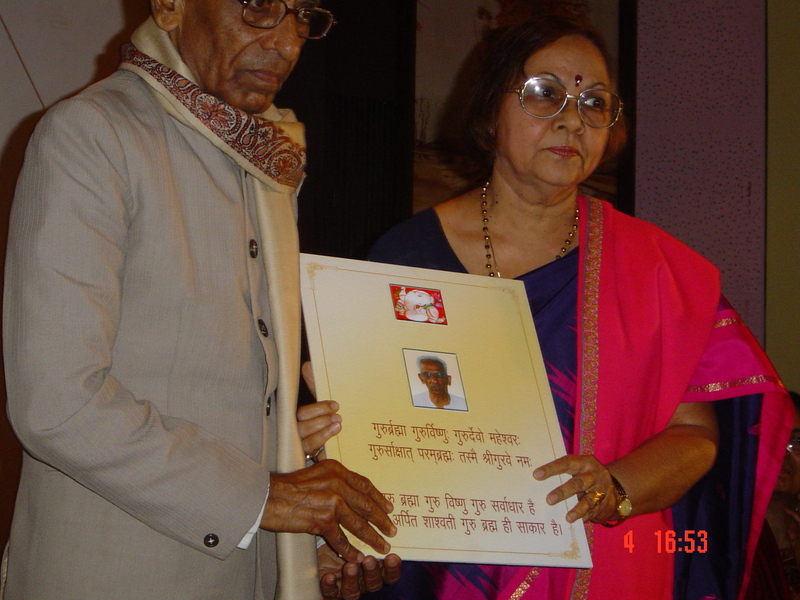 The Bhojpuri Samaj representative spoke of Pitaji who was one of the founding members of the society. Then, lastly, came the turn of the relatives’ rep. And Bhaskar Bhai had selected me for this. With the instruction to speak in Hindi. The last I spoke in Hindi was in my high school, in the elocution contest, but those were memorized pieces. Not that I have a stage fright, far from it as my job entails me to speak to large and diverse audiences on a large number of diverse topics. But these are all in English. But to speak in Hindi, in front of such an educated audience and that too on Pitaji was something which gave me shivers. But finally I did. I decided to speak about Pitaji’s two passions, education and reading. I made the speech anecdotal, with a series of personal references which I think went down rather well with the audience. 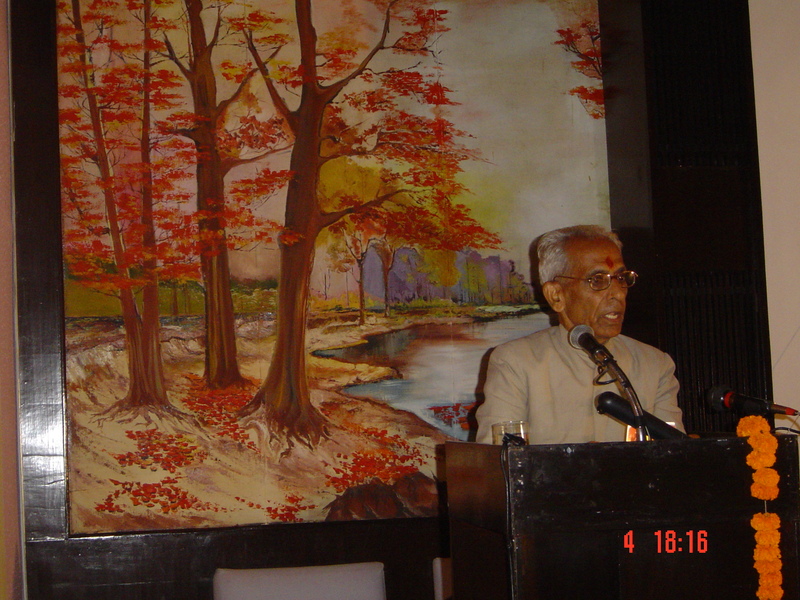 I had grandiosely announced at the beginning of my speech that I will speak only in Hindi with no trace of English. As it transpired I did use quite a few of them! Anyway, all told a fairly satisfactory experience. The highlight of the third and the final part of the program were the speeches of the distinguished speaker for the evening, the head of the Hindi and Journalism department of Ranchi University, Prof Rita Shukla who had specially driven from Ranchi cancelling some other urgent work. Prof Rita Shukla’s father, late Prof Tiwari and Pitaji were friends for many decades and she calls Pitaji mama. “Matul” as she said in her highly Sanskritized Hindi. She said she felt honored to be a part of the proceedings as she felt that Gods are present wherever elders are felicitated. Matters became a lot more emotional half-way through her speech when Prof Shukla broke down when she made a reference to her deceased father and how she felt that she now considers Pitaji as her father. This moved a lot of us in the audience too to tears. She did quickly recover and carried on longer. An erudite talk, delivered from the heart! And finally came the turn of Pitaji, who to my surprise started off in his usual gentle but confident manner but broke down soon enough perhaps overwhelmed by the proceedings of the evening. However he recovered quickly on delivered a brief but utterly absorbing speech thanking the organizers of the meeting, He spoke about the love and respect he got from his peers, students and society at large. The program ended with some coffee and snacks and a lot of badhiyan, mubaarak all around. And then it was time for more celebrations with the extended family at home. My niece, then all of 10 years old then had organized from a nearby bakery a birthday cake (eggless, of course) for the birthday boy. Thankfully not with 81 candles but just two, forming the number 81. Which were blown amid the backdrop of balloons and streamers. Happy birthday sung. Cake cut. And then the magic moment. When mai fed Pitaji the first piece of the cake while we all clapped! The old man’s initiation into the world of birthday ceremonies! The next day we all woke up late thanks to the late hour we all had gone to sleep. We were a bit concerned about Pitaji and were wondering how this delayed sleep would hamper his daily routine the day after. Pitaji was perfectly fine, doing all the morning stuff he does; getting the milk, buying extra newspapers for all the guests at home, filling filter water in the bottles etc. Nice we thought, his 81st year has begun well. Pitaji had volunteered to sleep in the Puja room as there was paucity of space with so many people around. Mai informed me in the morning and that he had not slept a wink as he was engrossed reading the book “Pranati” through the night. And mai would not stop telling us that Pitaji would keep wiping his tears as he read though the pieces, though the night. You are currently browsing the Santosh Ojha's Weblog blog archives for September, 2009.